Abstract : A standard approach to describe an image for classification and retrieval purposes is to extract a set of local patch descriptors, encode them into a high dimensional vector and pool them into an image-level signature. The most common patch encoding strategy consists in quantizing the local descriptors into a finite set of prototypical elements. This leads to the popular Bag-of-Visual words (BOV) representation. 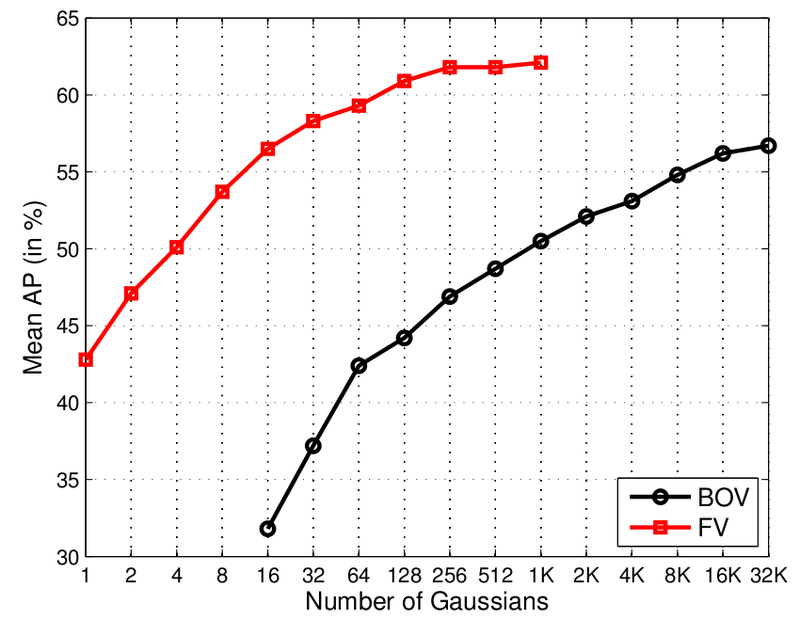 In this work, we propose to use the Fisher Kernel framework as an alternative patch encoding strategy: we describe patches by their deviation from an ''universal'' generative Gaussian mixture model. This representation, which we call Fisher Vector (FV) has many advantages: it is efficient to compute, it leads to excellent results even with efficient linear classifiers, and it can be compressed with a minimal loss of accuracy using product quantization. We report experimental results on five standard datasets -- PASCAL VOC 2007, Caltech 256, SUN 397, ILSVRC 2010 and ImageNet10K -- with up to 9M images and 10K classes, showing that the FV framework is a state-of-the-art patch encoding technique.